The British singer-songwriter’s latest offering, ÷ (Divide), will drop on 3 March (17), and follows on from his first two offerings + and x. Ed further sent fans into a frenzy by sharing the track listing on his social media pages. 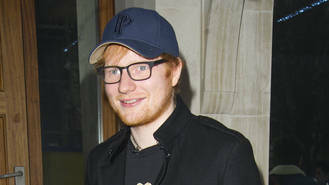 Singles Castle on the Hill and Shape of You have already been released as digital downloads, and Ed has now shared his gratitude to fans for supporting the new material. In a recent interview the 25-year-old singer admitted that he wasn’t bothered if his new sound wasn’t a hit with fans as he’s already received praise from his musical idols. Speaking to Britain's Radio X he recalled how Van Morrison told him how much he loved him, while Eric Clapton praised the musician during a dinner at Ed’s house. Ed also revealed earlier this month (Jan17) that the Justin Bieber track he penned, Love Yourself, was initially meant for his forthcoming album, however he passed it over as he thought it was unlikely he’d recorded it.